Voting is now open for the Landezine LILA awards (People’s Choice) where the Flower Chair by Street Furniture Australia has been shortlisted in the Products category. 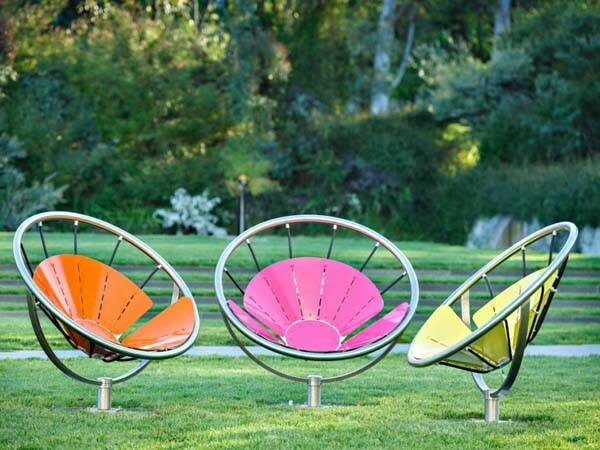 The first dynamic seat from Street Furniture Australia, the Flower Chair is designed to encourage play and interaction with public spaces. A movable seat that is fixed to the ground, the Flower Chair gives place makers peace of mind that their assets cannot be moved while allowing users the flexibility to turn and adjust their outlook. Key features of the Flower Chair include a 180-degree swivel function facilitating maximum comfort and empowering sitters to survey the best view, change their position in relation to the sun, interact with their neighbours or enjoy some solo time; powder coated finish in any desired colour for dramatic effect; and shape and colour making the product infinitely photogenic for sharing on social media, raising the profile of a space and attracting more visitors to enjoy it. The seat is designed by Josh Flowers, a former industrial design student at the University of New South Wales, and winner of a design challenge set by Street Furniture Australia in partnership with the university, called Sense of Place. The brief challenged students to design a street furniture product that would give people a reason to stop and become involved in a public space. Flowers explains that the Flower Chair is designed to activate and uplift public spaces. As part of Street Furniture Australia’s commitment to developing young industrial designers, Flowers will receive royalties for his Flower Chair, while achieving a dream to see people interact with his seat in the public domain. Prototypes of the product were extremely well received at the 2016 International Festival of Landscape Architecture in Sydney. The Flower Chair will be officially launched in October 2017.